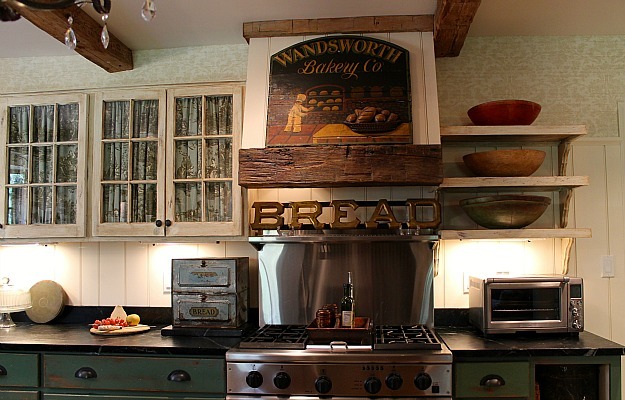 I love how she uses antiques and vintage finds in her home to give it character and a sense of whimsical style. And isn’t that “Thanksgiving” sign perfect for this time of year? 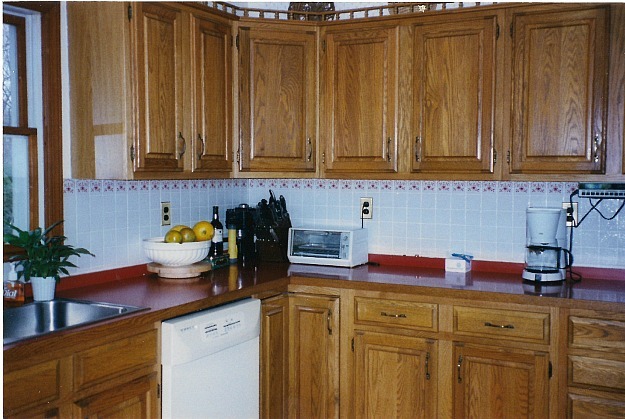 Those upper cabinets were actually salvaged windows. She gave lots of helpful details and answered lots of your questions in the comments of that post about her kitchen if you want to know more. Many thanks to Renita for sharing her home with us. You can see her kitchen makeover here. Happy Thanksgiving! I love that she painted that scalloped edge white – it is such a lovely detail and would make me happy every time I walked in that room. Beautiful job! 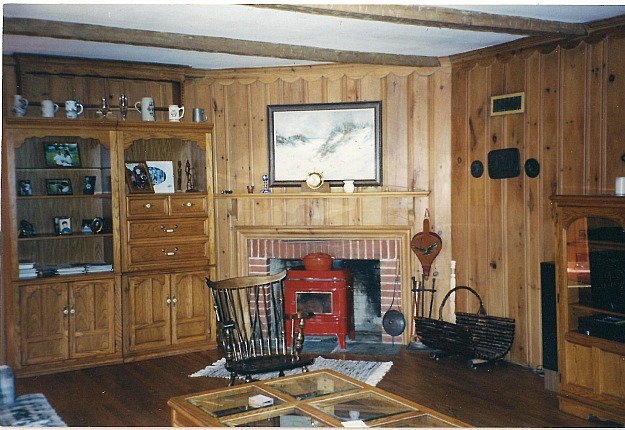 agreed – painting the knotty pine paneling, beams and scalloping was a brilliant idea! The end result is amazing! Now I want to see more rooms in Renita’s house!! WOW!!! That was amazing! 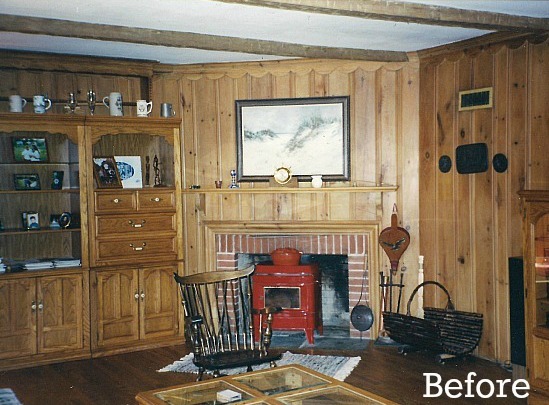 I love before and after photos – wouldn’t have believed it was the same room without the scallop trim! Thanks, Trish. Have a nice Thanksgiving! That is a Wow!!!! I love the color blue she used. Gorgeous. Thanks, Gail. Happy Thanksgiving to you and your family. I would love some details about painting that wood and a close up of a panel. I have similar wood in my dining room and I am so scared to paint it! We used a primer and then oil paint (I believe). Don’t be scared to paint it if you don’t like it the way it is. I am sure you will be thrilled once it is done! Good Luck! Wow, Laura! What an amazing compliment! Thanks so much. Good luck with convincing your parents!. What a cool house!!!! I loved the kitchen, but this is great too. Got any bedrooms to share with us? ha ha. Have a happy Thanksgiving Julia! I LOVE this! It’s exactly my taste. Just gorgeous and simple. Thanks, Amy. Have a great Thanksgiving! Thank you Kim. WIshing you a wonderful Thanksgiving to you and your family, as well. Whoa! Incredible! This is soooo beautiful! I love the wall color… serene! Have a lovely day, Julia! Thanks, Luciane. Happy Thanksgiving to you! What a happy space! Love it! Thank you Erin. Happy Thanksgiving to you! Thank you Marcela. Happy Thanksgiving! This is a wonderful transformation! I too would like to know more about painting the knotty pine paneling and how to prevent the knots from bleeding through. My parents filled the house with it in 50s and I can’t stand it, but have never known exactly what to do with it because of the knots. Thanks, Tim. We primed the paneling and then used oil based paint (I believe). The knots did not bleed through but we put at least two to three coats of paint on. Good luck with your paneling! Just beautiful! Love every single thing! 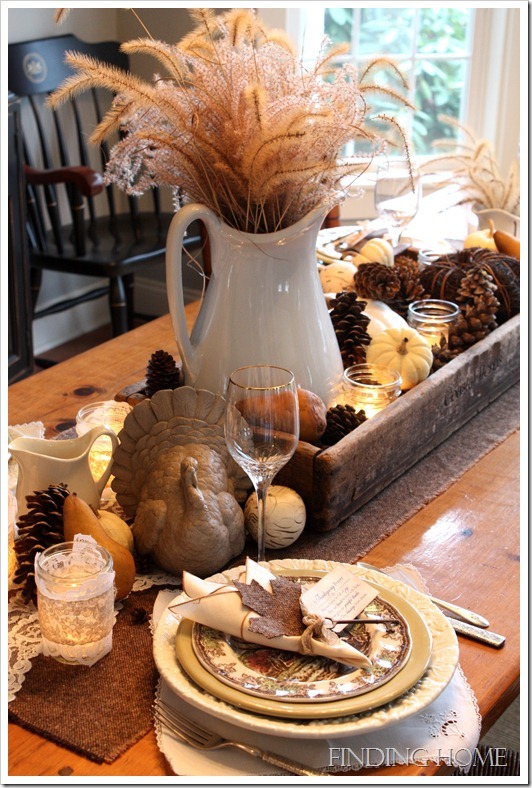 What a wonderful room to gather family and friends for Thanksgiving dinner. Thanks for sharing! Thanks, Martha. Hope you enjoyed your Thanksgiving! love it- looks very cozy and inviting! Have a wonderful Thanksgiving! Thanks for your comment. Hope you had a great Thanksgiving! 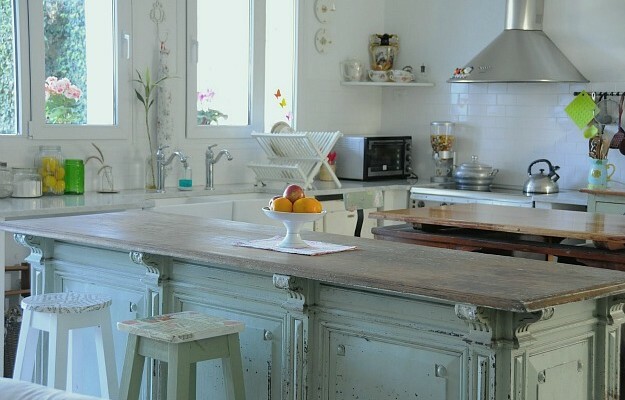 I have so much respect for the repurpose and reuse of so many details in her beautiful home. She’s very creative and innovative. Lovely. Thank you, Julia and Renita, for sharing! Thanks. I love to repurpose as you can tell! Hope you enjoyed your Thanksgiving! This is gorgeous! Renita is a genius! It’s so cozy and harkens back to a much simpler time. LOVE it. Thanks, Meredith. What a nice comment! Hope you had a great Thanksgiving! So pretty! Thanks for sharing … Happy Thanksgiving Julia!! Thanks for your comment. Hope you enjoyed your holiday! 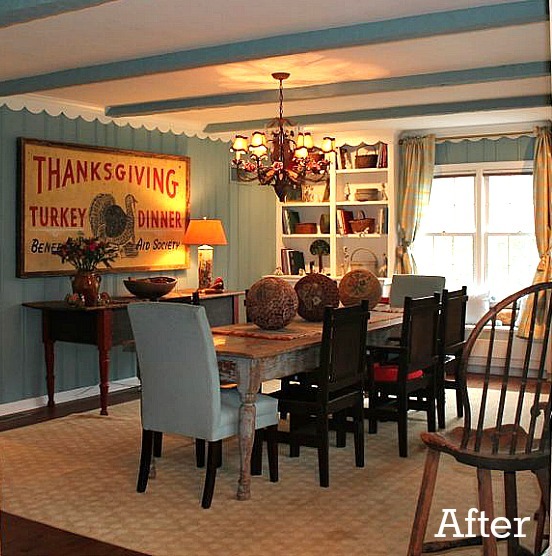 a perfect transformation – and so inviting for a cozy Thanksgiving dinner! Thank you Blake. Hope you enjoyed your holiday! LOVE this home inside and out !!!! I wouldn’t have never dreamed of doing the things she did…..not brave enough or lacking in decorating talent……but she sure knows what she is doing. She NEEDS to start a bog, PLEASE!!!!!!!!!!!!!!!! Thanks so much for all your kind words! I am about to start a blog in the next few weeks. I hope to talk about my antiquing and decorating adventures. I am out of town and have taken pictures of a number of great things in a couple of markets that I stopped at. Can’t wait to share them. I hope you enjoyed your Thanksgiving holiday and thanks again for your feedback. LOVE LOVE LOVE! Wow! So creative and personal! Looking at the exterior of your house, it looks like it was built about the same time as mine, which makes me wonder about the floor plan. Is the eat in part of the kitchen in the other post in what is “supposed” to be the formal dining room and then what’s “supposed” to be the formal living room now the made-over dining room? If so, that’s kind of what we’ve done with our house. We have a big family and needed more space for a bigger dining table but have zero need for a formal living room, so we took it over for a bigger dining space. So glad to see you making your house your own. I’m so over people remodeling for some future buyer instead of making it what they really want or what their family needs. That’s clearly not an issue in your house! I totally agree. She is obviously brave and her design choices show it. She wasn’t afraid of taking risks and it paid off in a beautiful and unique home. You are correct! That is exactly how our layout used to be. Our house was built in 1939. Thanks for your very nice comment. I hope you enjoyed your Thanksgiving holiday! 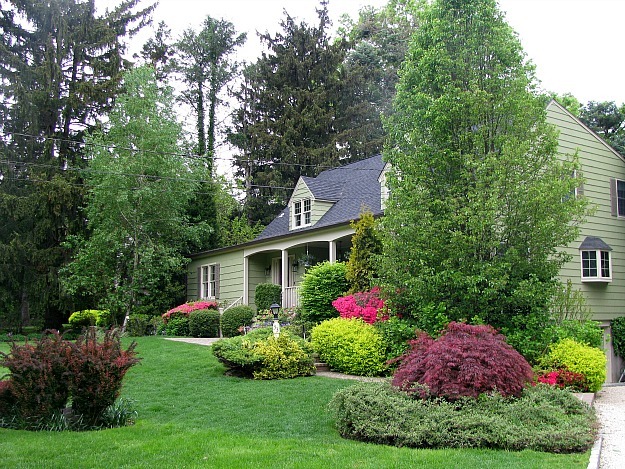 Hi Julia what is there not to admire about this lovely home. The lady has style. Thank you for sharing this beauty. Happy Thanksgiving. Regards Esther from Sydney. Thanks for your very kind words. Hope you enjoyed your holiday! I absolutely adore this dining room and kitchen as well! And the exterior is an absolute dream! I think we need some more pictures of the rest of the house! Thank you for allowing us to peak into our beautiful home! Thank you! I am working on pictures of the rest of our house. Enjoy your upcoming holiday season! What a nice transformation. 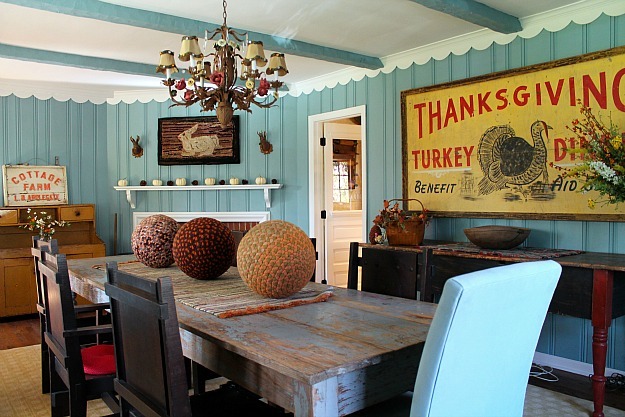 I love that she painted the wood paneling instead of tearing them out. It really made a big difference. Thanks for your comment. I did not have the heart to rip the paneling down. I appreciate your feedback. I haven’t seen any changes in this home that I don’t absolutely love. The painted paneling looks amazing. I love the color and the scalloped trim. The exterior is just as well done. I hope to see more of this lovely home. Hi Carol. Thanks for your nice comments. I am working on taking pictures of the rest of my house. Have a nice holiday season! With just a few changes and some paint, it’s amazing how much the room has developed. I love the fact that you kept the scalloped edging at the ceiling. I do covet that sign too! Loved your kitchen. Love your dining room. Thanks so much for sharing. Happy Thanksgiving. Thanks, Rebecca. Paint is a wonderful thing! Hope you enjoyed your Thanksgiving holiday. Absolutely gorgeous! and the garden is really stunning! Thanks for your kind words. Have a nice holiday season! P.S. I absolutely love your country! Whew! So glad they saved that scalloped trim + even emphasized it with color! CHARM-ing! Thanks, Kay. I appreciate your comments. Have a great holiday season. She can come redo my house any day! Cate, exactly what I was thinking! Renita, you have such wonderful ideas and the end result is perfect. Thank you for sharing your home. Thanks, Carrie. You are very welcome! I love it. Such a great job and it makes me sooo happy to look at. Thank you Patti! I’m glad you enjoyed seeing it! Happy holidays to you! I thought all of the kitchens were amazing. This was a very fun feature. Her before is so classic. It is interesting to me how unappealing the before is vs. the after. Back in the day, the before was the look. Our tastes have really changed. Thanks for your comments. Have a nice holiday season. Renita, may I ask where you scored such an awesome Thanksgiving sign? Actually all the signage you have in your home is cool. I love vintage signage but can never seem to find any in Chicago or outlying areas! Many thanks and Happy Thanksgiving under your amazing gobbler sign! Of course you can ask…I got it at an auction in upstate New York. If I remember correctly, I think I was the only bidder probably because it was so large! I actually had to have it cut down because it was even bigger! SIgns are definitely my weakness. I actually picked up three this week!! I wish I could give you the names of some places in the Chicago area to shop but the midwest is not an area that I am that familiar with. There used to be an antiques mall off the 80/90 tollway(?) right when you cross into Indiana I believe. That was a number of years ago though. I actually purchased the two deer heads (not real of course) that are above the fireplace in the dining room (I think you can see them in the pictures) at that antiques mall. Anyway, have a wonderful holiday season! They made magic with just paint and a change of furniture! Fantastic! Thanks, Carisa. Have a nice holiday season! I am in love with that house, inside and out! Thank you Kelly. Happy holidays to you! Lovely room! Love the scalloped edges! I have white shelves like that only without the scallops. Maybe I can find a way to add some. Thank you for your comments. 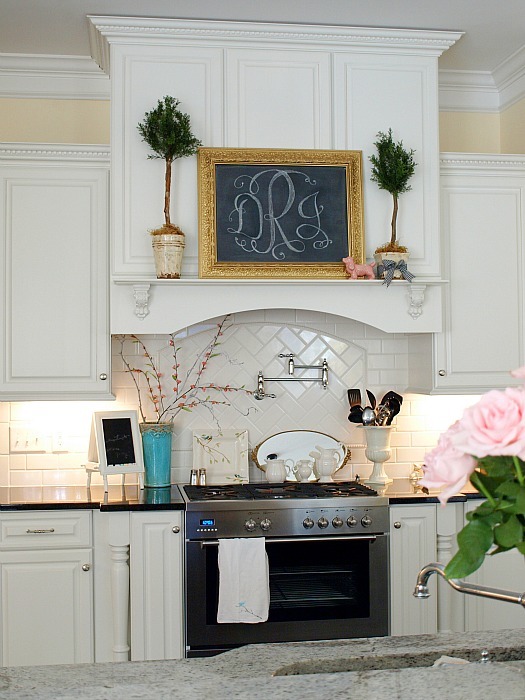 I would think that scalloped trim can be purchased just like crown molding can. Good luck. One of the best remodels you’ve posted. This lady has it all over those professional decorators and impersonal mansions of the super rich. Thank you for your nice compliments! Have a nice holiday season! When I saw your kitchen I totally fell in love with it. Everything just felt right. Homey & warm. Like arms wrapping around you giving a hug. 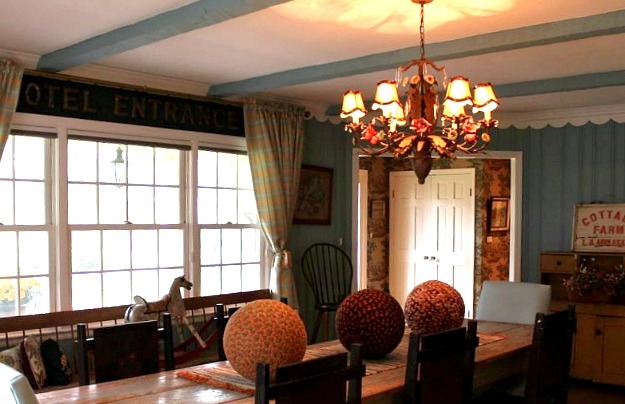 Your dining room is cheerful & comforting at the same time. What an absolutely wonderful home to create memories in. Thank you Sandy for your kind words. Thanks for your comment. Have a nice holiday season! Thanks for your kind words. Have a happy holiday season! Renita, I think painting the wood paneling was brilliant! And what a neat color. I want to see more of your house too. I’m about to turn my dining room into a sitting room and the office into the dining room, so thanks for the visual encouragement!! Thanks for your nice comments. I am working on taking pictures of the rest of the house. Good luck with your room transformations! Renita, painting the paneling was brilliant! I’m about to turn my dining room into a sitting area and the office into a dining room, so thanks for the visual encouragement!! Love it all. The balls covered in turkey feathers (?) on the dining room table are so cool! Thank you Lisa. The balls are actually large rage balls made out of fabric. Enjoy your holiday season! I am so in love with this! I don’t know where to start but everything, the entire room is just full of love and warmth. Thank you Nisha. I appreciate your comments. Have a happy holiday season! I love how you transformed this room into a very warm and inviting place. You definitely have the gifted talent of decorating. Seeing your photos, you are giving me several ideas on what to do as I am bringing my grandparent’s 100 year old farmhouse back to life. Please keep the pictures coming. They are so enjoyable. God Bless. Thanks for all your compliments. Good luck with your grandparents’ house. I am going to take pictures of the rest of my house shortly. Happy holidays! This is lovely and inspiring. Instead of trying to look just like the design magazines you have set the standard with something totally unique and original, all while managing to acknowledge current fashions with your clean color choices. Thanks Wendy. I appreciate your comments. Have a great holiday season!